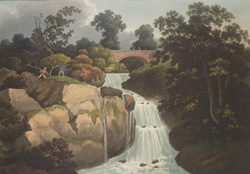 View of the falls and the bridge across the River Lwyd at Pontnewydd in South Wales. The area is best known for a prehistoric cave in which the remains of Neanderthal man were found. Pontnewydd translates from the Welsh as ‘New Bridge’.